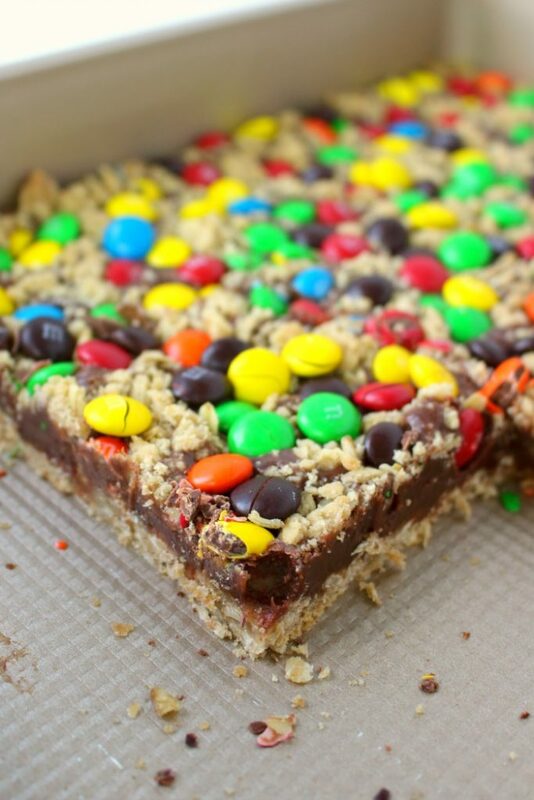 If you love M&M’s, you’re gonna go crazy for these cookie bars! 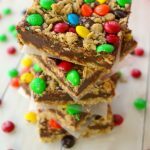 An oatmeal crust, with a thick, delicious fudge center and topped with oatmeal crumble and loads of M&M’s make these bars incredible! The ultimate chocolate treat! 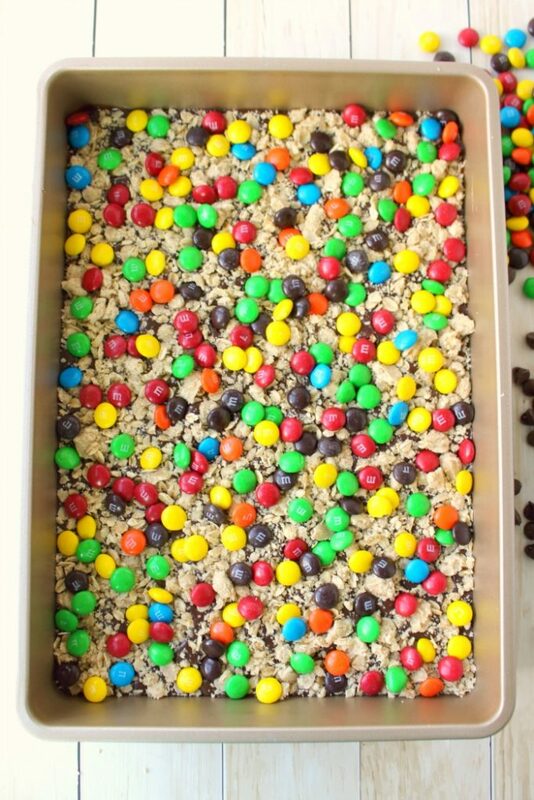 When deciding to make this colorfully studded version of magic bars, I couldn’t help but add loads of my favorite candy. 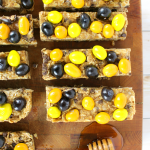 This bar recipe actually originates from my mom’s “Easy Bar” recipe. 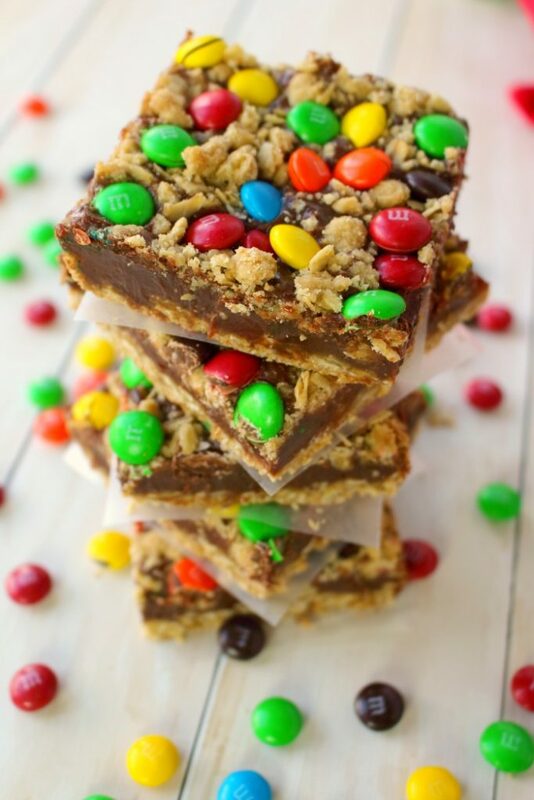 I’ve made it numerous times, and have added everything from caramel bits, peanut butter chips, but this M&M’s version is, by far, my favorite! This recipe, much like it’s original recipe namesake (my mom’s Easy Bars!) really couldn’t be more simple to make. You’ll start by mixing together the crust, which is pressed into the bottom of a 9 x 13″ pan. Note in the recipe that you’ll reserve about 1/4 of the crust mixture, as that will get sprinkled on the top. 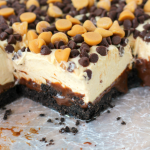 Over the top of the bottom crust will be a thick, delicious fudge layer that is made from butter, sweetened condensed milk and chocolate chips. 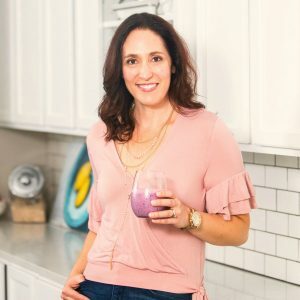 This bar recipe is a lot of things, but healthy, it is definitely NOT! 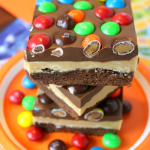 🙂 Over the fudge layer, you’ll then sprinkle the remaining crust and then top with lots of M&M candies! From here you’ll bake for about 20 minutes. Once these bars come out of the oven, you’ll have the most delicious chocolaty cookie treat ever!! 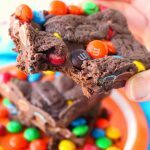 The oatmeal crust is light and tender, and the fudgy center is the perfect compliment to the M&M candies that bejewel the top of these bars. 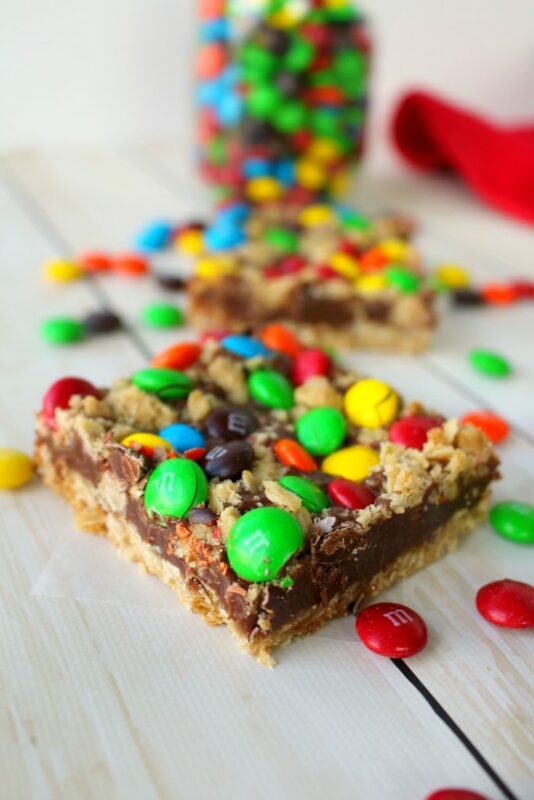 You can slice these bars as large or as small as you like. 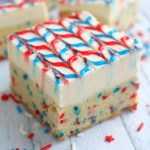 I’ve actually just made a batch of these to go to my son’s school for a bake sale – for those I cut into large squares (15 bars out of the 9 x 13″ pan). But feel free to go smaller – these are definitely rich, and sweet and a little bit goes a long way! Not only are these great for a bake sale, they’re fantastic for a classroom treat or a fun after-school snack. I’ve also served these for my girlfriends for a book club night, and they disappear just as fast as the wine! 🙂 I’ve also sent these in with my husband for a work pot-luck, and the pan always comes home completely empty! I think it’s safe to say that both kids and grown-up LOVE these bars! 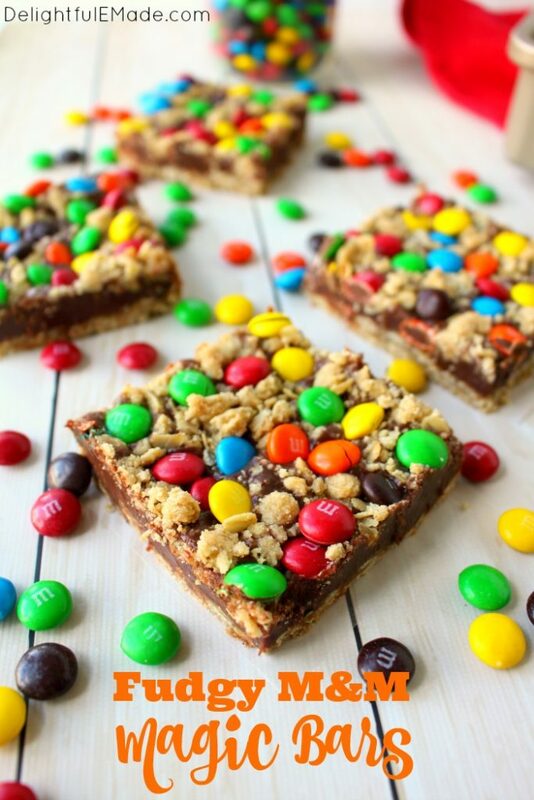 If you love M&M's, you're gonna go crazy for these cookie bars! 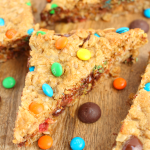 An oatmeal crust, with a thick, delicious fudge center and topped with oatmeal crumble and loads of M&M's make these bars incredible! The ultimate chocolate treat! Preheat oven to 350 degrees. Lightly spray a 9x13" pan with non-stick baking spray. Set aside. In a mixing bowl, combine the oatmeal, flour, brown sugar, soda and salt. Mix until combined and the brown sugar has broken apart. Pour the melted butter over the top, and mix until crumbly. Pour 3/4 of this mixture into the bottom of the prepared pan (reserving 1/4 of the mixture for the topping.) Press the oatmeal mixture firmly into the bottom of the pan forming a crust. In a separate microwave-safe bowl, add the sweetened condensed milk, chocolate chips and butter. Microwave on high for 1 minute. Stir. Microwave for another 30 seconds and stir until smooth. Chocolate chips should be completely melted. Pour the chocolate mixture over the prepared crust. Sprinkle the reserved oatmeal crumble mixture over the top of the chocolate fudge filling. 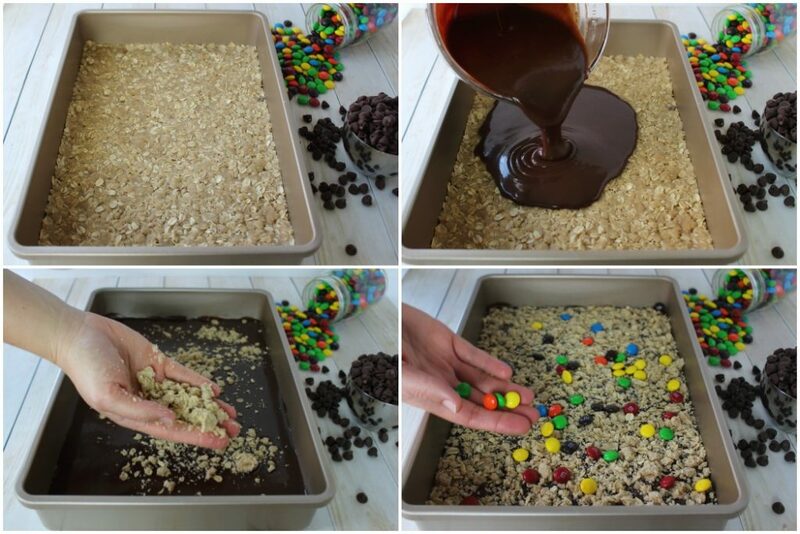 Sprinkle the M&M candies over the top as well. Bake at 350 degrees for 20 minutes. Let cool completely before cutting.